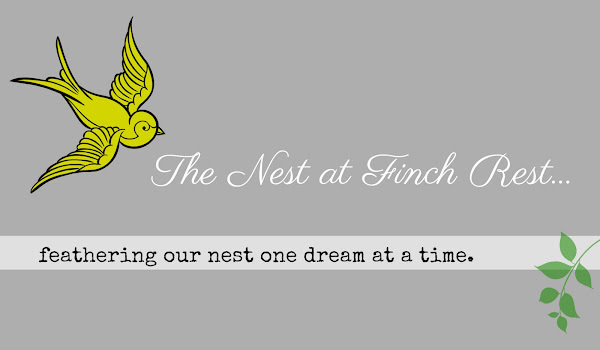 The Nest at Finch Rest: Tea Cup Exchange Reveal! 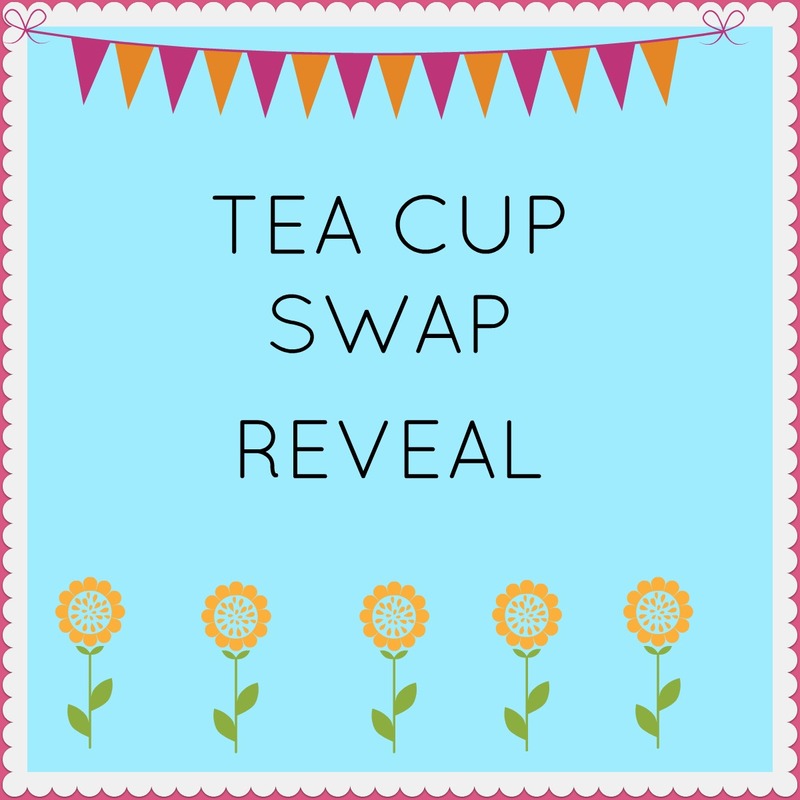 The Enchanting Rose blog TEA CUP EXCHANGE! because swappers from all over the world are involved. It takes a little time to travel the globe! my wonderful exchange experience with you all! is the very best part! Just look at this lovely teacup she sent to me! Her package to me was loaded with awesomeness! in tiny vintage baking tins. I will treasure it always! of the cute Sunflower card she enclosed? tea cup coaster from Stephanie's blog right here. I have it in my office and use it several times a day. It will always remind me of Kelly AND Stephanie! A little birdie must've told her how much I love bird things. 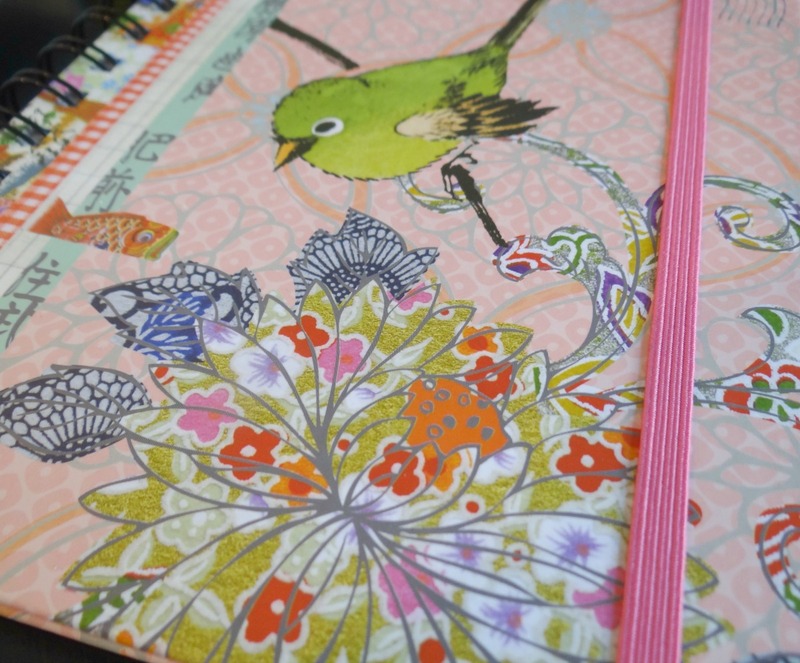 I have already been using my sweet notebook! It's become a permanent part of my purse arsenal now. 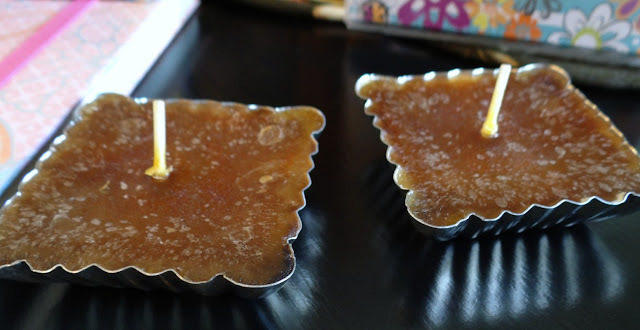 These two wee candles are just so adorable! 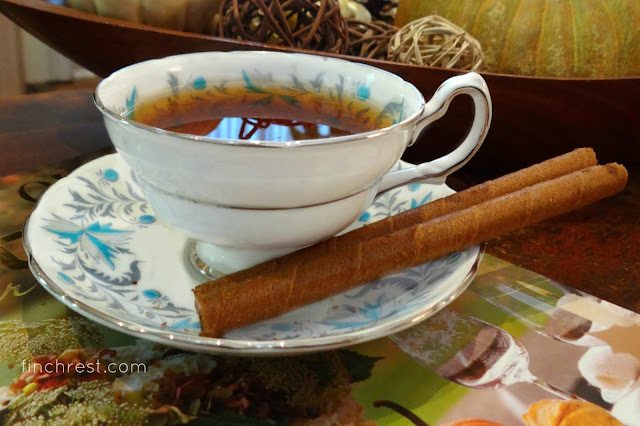 I just love these teacup exchanges! If you haven't joined in the fun, I highly recommend it! I cannot even fathom how much work goes into it! and getting ready to nosh one of these yummy chocolate tuile sticks. It's the perfect little tea time for one! with a friend I blogged about not too long ago. 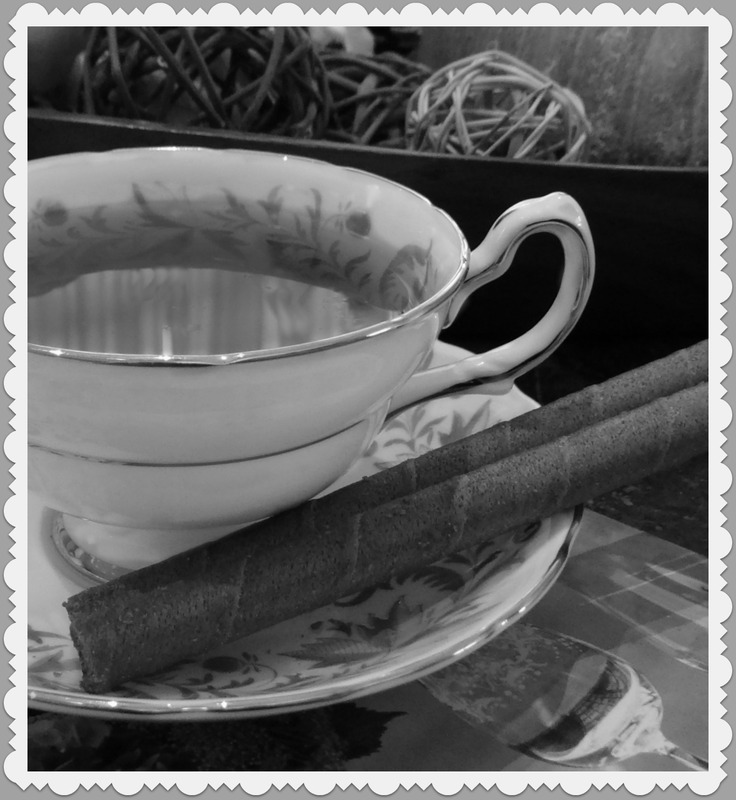 Playing with PicMonkey in black and white here. to a sweet blogger, Cindy, from Consider It All Joy blog. of what I sent before I boxed everything up. I was happy I did so. 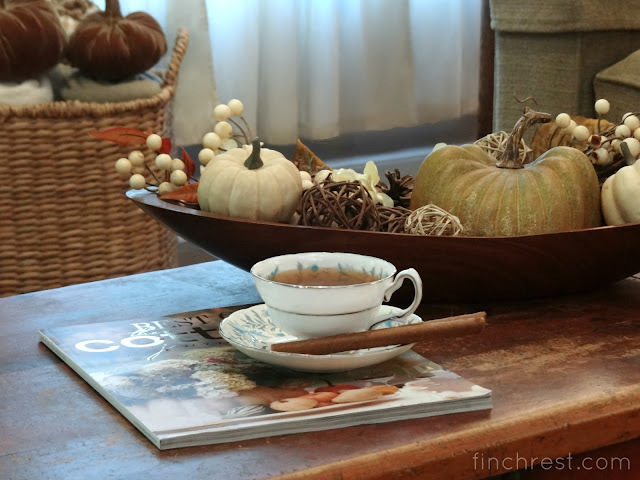 pumpkin decor, a handmade card and a yellow rose teacup. a new friend or two. and is so sincerely appreciated! 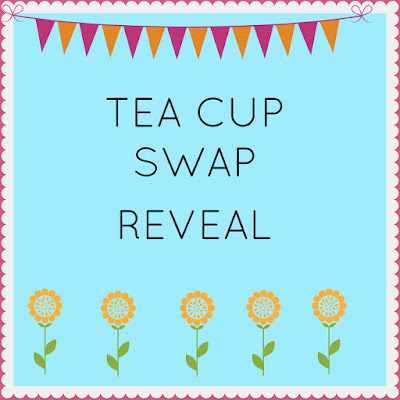 Please visit her blog and check all the swaps! Poofing the Pillows blog you can find it here. What fun, Michele. It makes me wish I collected tea cups and wasn't trying to downsize-lol. I know I have seen that pattern on the cup you received. I am thinking it is from the 40s or 50s and was one of those that came as a bonus when you bought something (like detergent, etc). Those are quite collectible now. Just love them.. all beautiful goodies..
That is a beautiful teacup. For some reason I thought you weren't blogging much but I see what I've missed. 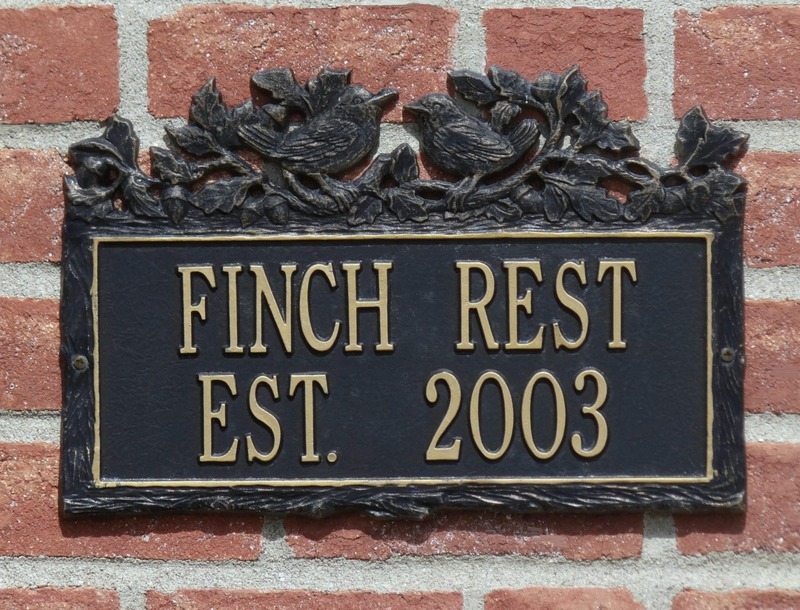 I enjoyed your home tour--your home is lovely. I hope you are feeling better by now! You really got some wonderful items and I love your tea cup. I would join, but I am trying to down size and have more than enough tea cups. You really sent a lovely pacakage with your tea cup. Glad your back blogging again as I really enjoy your posts. How exciting to be paired up with Stephanie's aunt! I experienced Kelly's generosity when she sent me a teacup a few years ago. I'm loving the pretty grey and white teacup that she sent you. I always enjoy seeing the variations of Stephanie's teacup coasters. I'm sure that Cindy was thrilled with the autumn-themed package that you sent her. Great treasures!Both teacups are just wonderful,looove them!Such fun!Hugs! Lovely gifts both given and received! Stephanie is aMaZinG! Oh, what loveliness!! Both, what you gave and what you received!! It is just delightful to do the mug exchanges! Such a dear blessing to meet other kindred spirits and be able to bless one another this way! So happy for you and all of your goodies!!! "teacup Ministry" - how perfectly put, Kitty, because that is exactly what it is - and is exactly how she takes it on. Brilliant term. Wow what a wonderful way to share gifts and receive lovely gifts. The swap is really a fun idea! Your fall items I’m certain were really appreciated. Hopefully I can tryout this great swapping of tea things. Your photos were so beautiful and glad you shared your experience. So you, my sweet lady, had the wonderful opportunity of receiving from Kelly, my dear sister-in-law!! 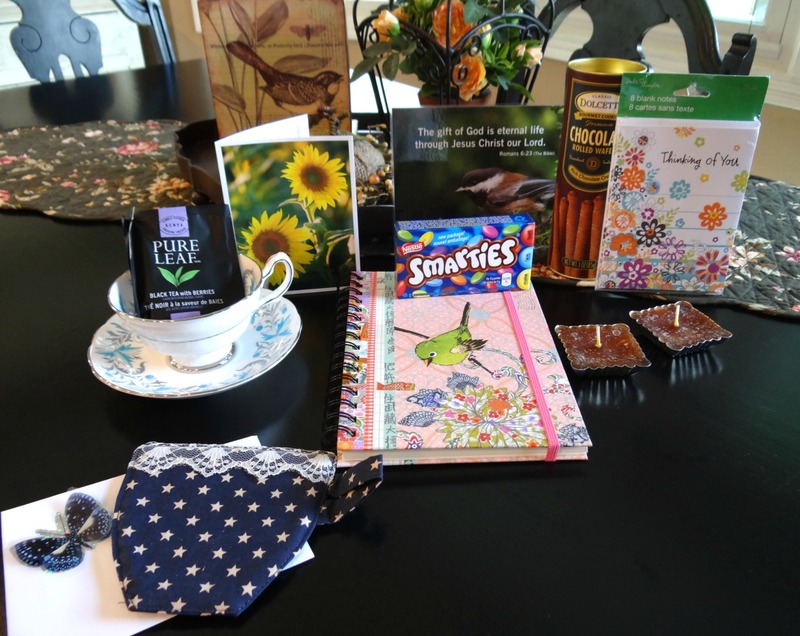 Your tea cup and gift box that you sent off to Cindy is gorgeous!! 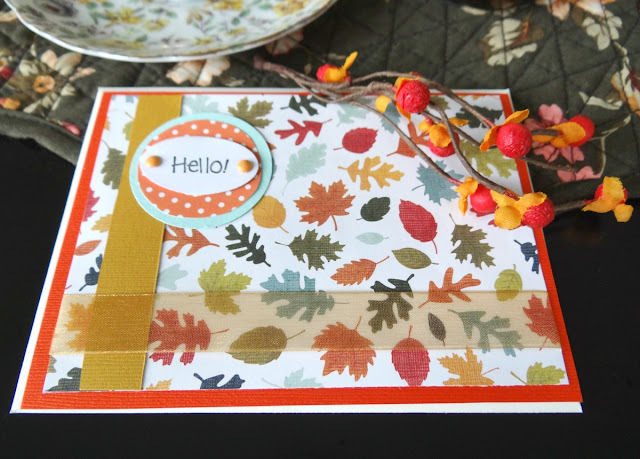 What a lovely fall theme, so bright and cheery. Cindy must have been in her glory when she opened that. That sounds like a fun exchange. Love your new teacup and I smiled when I saw your journal because I have the same one here beside me....it is my cottage journal. Love your autumn themed tea gift you sent as well. Excuse me but that turquoise and gray teacup belongs in MY house haha!! Wow - that has to be one of the prettiest ones I've seen! How nice a treat you exchanged! God bless you Michele. Wow - what fun - seems everyone is happy!!!!! That exchange looks fun! You got some nice things, and I pinned the teacup coaster tutorial, and you gave some nice things, too! Be still my heart....both tea cups are exquisite! LOVE the one Aunt Kelly sent to you - the color and design is quite unique. And oh, the tea cup you sent to Cindy is breathtaking! 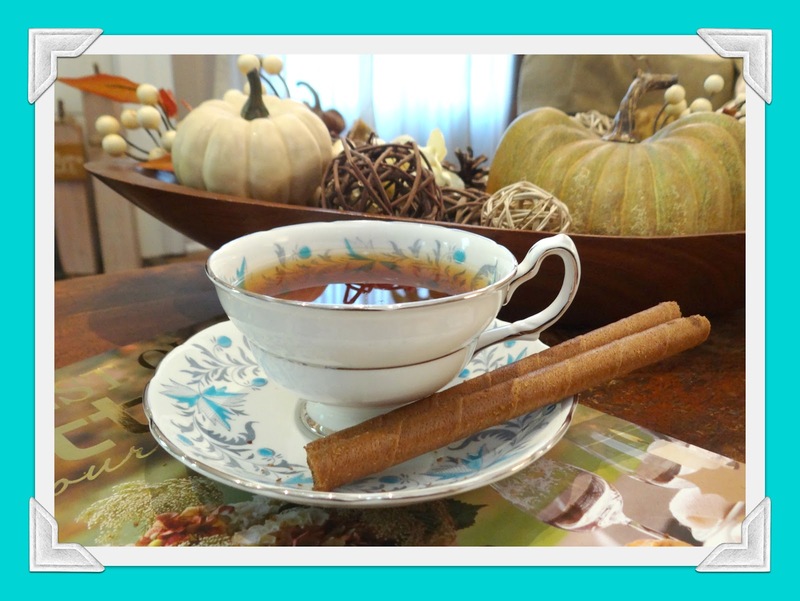 What wonderful Teacups and goodies...both coming and going! Very thoughtful packages indeed...perfect for the recipients...think she might know you well! Thanks for linking to Tuesday Cuppa Tea. Michelle, the birdies are definitely YOU! Ha! I love the teacup ... love the teal ... one of my favorite colors. It's always exciting when the box arrives and you wonder what tea goodies are inside! This exchange is so much fun isn't it? Both teacups coming and going are so pretty. What a fun exchange! Both the one you exchanged and the one you received are so lovely! Hello Michele, it's been so long since I have stopped by your lovely blog. Your gifts are delightful. I agree, these exchanges are so much fun. It's nice to meet so many who love the things that we love. Oh, Michele..what a beautiful tea cup Kelly gifted you with! Oh and how sweet she included such delightful gifts... You blessed Cindy with a lovely package...I love how ypu made it a pumpkin and Fall theme! This exchange us a true joy! Michele, I can't decide which I like more - the cup you sent or the cup you received - both beautiful! Stephanie's exchange looks like such fun. What fun to come and visit with you! You sent and received some lovely things and I agree that the swap is great - bless Stephanie for organizing us all. How darling! That really is a neat thing to do! I love what you received as well as what you gave. It’s fun to see the various combinations of things chosen for each swap. Enjoy! So many beautiful gifts given and received, I was blessed to have been the giver to Cindy at Consider it all Joy a couple of exchanges ago...what a sweetie she is! I also have a few of Stephanie's fabric mug coasters..I won them in a giveaway a couple of years ago and I use one of them every morning when I drink my coffee. 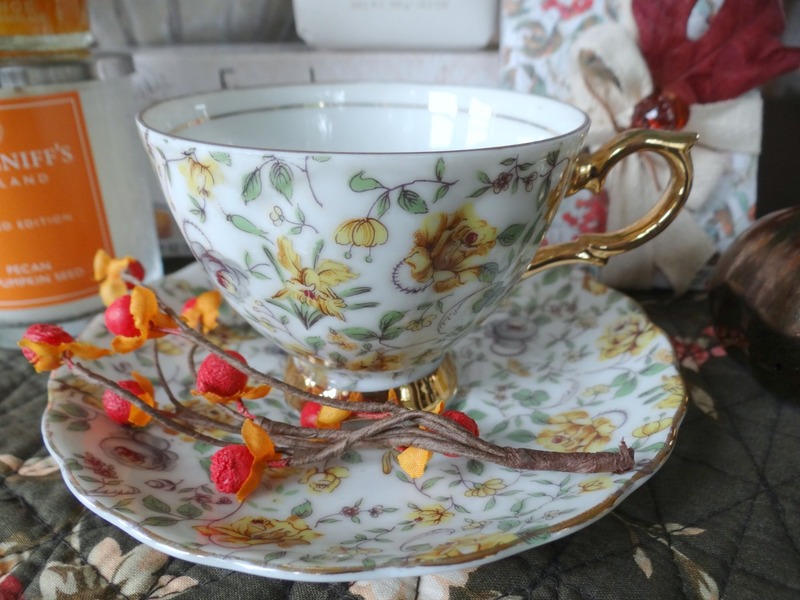 The teacup was GORGEOUS that sent to her, along with the other lovelies. It just amazes me, the many friendships that had been formed through Stephanie's wonderful ministry. Have a blessed week, my friend! HUGS! Hi Michele, I absolutely love the items you gifted Cindy with. 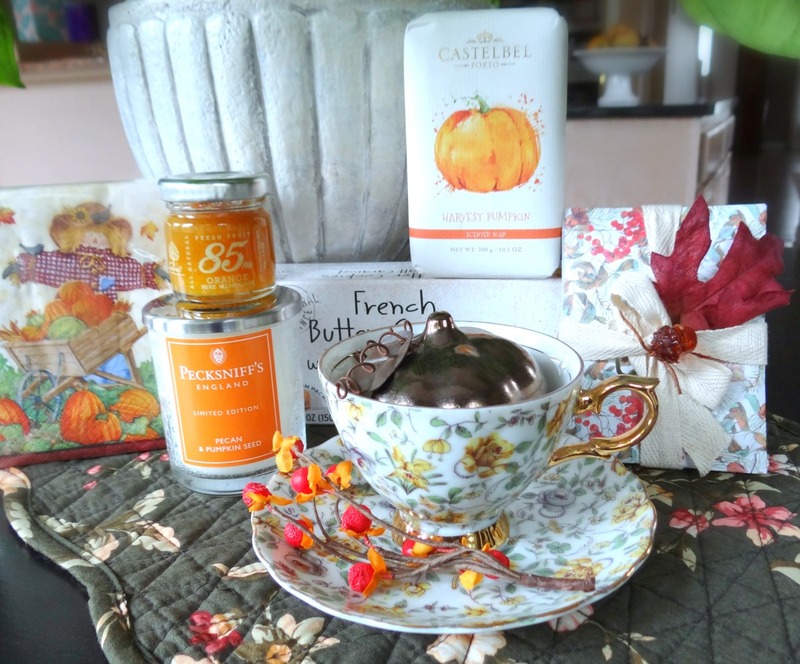 The tea cup is gorgeous (yellow being my favorite color LOL) and I love the Autumn theme. The package you sent, and received, are both so beautiful! I have always loved tea cups, so finding an exchange like this with so many wonderful people has been so much fun!